OMEGALUX™ Laboratory Heating Mantles are fiberglass insulating heating jackets specifically designed for heating laboratory vessels. 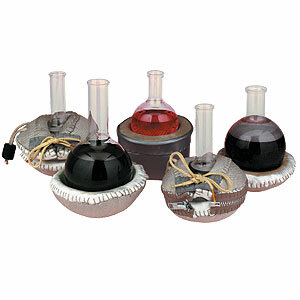 OMEGALUX’s Standard Laboratory Heating Mantles are available in eight different sizes, from 50 ml to 5000 ml. With OMEGALUX’s proven “self” standing design, you are able to place soft, form fitting mantles directly on your countertop. No more hassle with jack stands, support rings or bulky metal case units. Magnetic stirring is easily performed through the heating mantle. Try using our variable output CPP Series temperature controller, exact repeatable results can be achieved. The unique serpentine constructed heating element provides evenly distributed, low-watt density heat making these mantles ideal for highly sensitive applications.